The Blogger engineering team have found the problem in the comments area and they have a fix on the way. Thanks. Barely anyone is even singing along to CANADIAN National Anthem...cuz they couldn't! Ha! Nobody is ready to boogie down like that before a hockey game. I think I paid more in parking fines last year. Don't mess with the Goalie! ...Yeah and while you are at it, let's get the Beatles back together...but let's call them the Thrashers - GIVE THE PEOPLE WHAT THEY WANT! Mark and True North got it right, in the end. Ya think someone is dangling a Salisbury Nip over his head? Insert the John K. Samson line here for the easy assist. Unlike the Jets, The Guess Who were Number 1 in 'the BIG league'. Granted: Maybe they weren't the 'coolest' band of all time: I always imagine Randy Bachman eating Kubasa and cheese cubes for some reason - a tasty idea...but not quite the coolest visual that I can think of. Plus - and don't get me started - wasn't Randy a converted Mormon? So now, on top of this Ukrainian 'feast,' my mind's eye is now forced to gawk at Glenn Beck trayin'-up with the boys over at the Paddlewheel...with that peppy staff lurking in the background! I get religion (a bit more) when you are born into it, but converting AND staying cool??! So uh...yeah, 'cool' is out. For all that I know, Mormonism could very well be 'THE WAY'...but don't tell me that it's COOL! To try end this HUGE digression (sorry), I think that maybe Samson's character was wrong on both fronts: The Jets were Number 1 in the WHA (if you count this as a BIG league - yeah, you probably should)...and while the Guess Who might've been a little too heavy into the nips and sausages for this fan's liking (not really - I'm equally guilty), I just don't think it's accurate to say that they sucked. PS. For the non-locals, a review at TRIPADVISOR.COM described the Paddlewheel as featuring "Bland food, bland surroundings and a demoralized staff"...so um, book ahead! Another review gave the restaurant 3 stars and then went on to mention that he/she hadn't been there in 35 years...for 2 stars, this person holds out for 50, or what?! It looks like it was still open as of '08? I don't really know, to be honest. Bands like the Guess Who played gigs and hung out there in the 60's - it was truly a big part of the first music scene in all of North America to embrace the British Invasion Rock/Pop music. This song is by Winnipeg Locals Propagandhi. They are getting down "down under" in this footage. All that I know about all of the parties mentioned here, is that we all want the Jets back. Anything else is for the band and Coach's Corner to resolve. I'd like to see that debate! "Dear Ron MacLean. Dear Coach's Corner. in the end, a kid's game. they'll be grounds for screaming laughter. if I didn't sense some spiritual connection. We may not be the same, but it's not like we're from different planets. We both love this game so much we can hardly f*cking stand it. It seems like there ain't a sheet of ice north of Fargo I ain't played. a madman's dream of a paradise. Complexity reduced to black and white. How do I protect her from this cult of death?" THRASHERS MIGHT MOVE TO WINNIPEG? 35,000 fans vs. 200 fans? No contest. It's comical to listen to the fans in Phoenix talk about anyone trying to take 'their' team from them - Puleeeze! It would be like if Blogger shut down tomorrow and I was the first in line to cry, "Foul!" 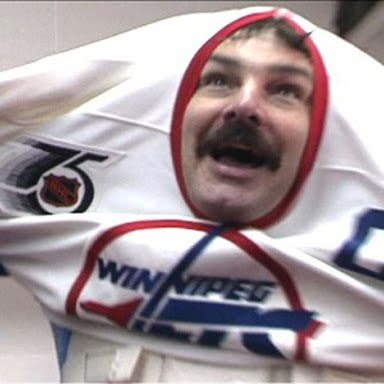 Don Cherry says it's only a matter of time before Winnipeg gets (another) NHL team...and I tend to agree. Keep in mind that this video is 3 years old. ...but what they discuss can still stand. 52,53,54 (Mike) Bossy's Record Is No More! "52,53,54 (Mike) Bossy's Record Is No More!" Teemu Selanne breaks the NHL single-season record for goals by a rookie.